See recent projects, designs & media we're excited to share ! Visit this link to an interview with company CEO, Lance Kirley, discussing the saltbox house style, a time-tested favorite and a symbol of early America. CCH has numerous new homes under construction. Follow their progress at this link. Visit this link to read an interview with Classic Colonial Homes CEO, Lance Kirley, discussing some details about the background of the company and the driving force behind their work. From it's onset, Classic Colonial Homes' guiding principal was to create residential architecture that combined spacious yet efficient, and comfortable open floor plans within traditional, historically inspired designs to create the warmth, charm and character that we most admire in antique New England homes. See some of our latest projects and designs; get inspired by other CCH home plans and interiors. 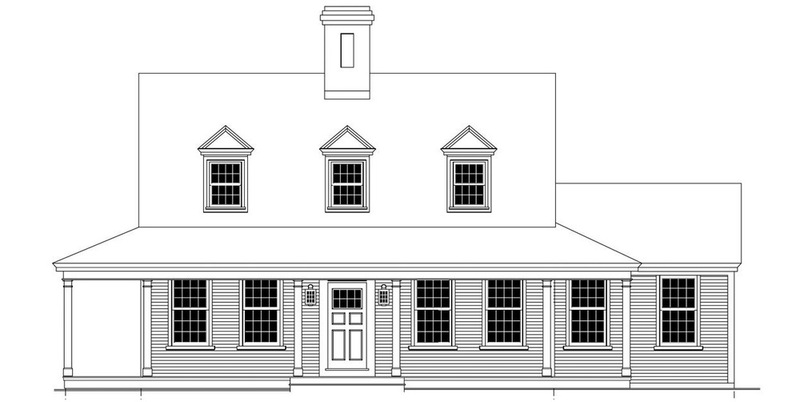 This is a new home design that we have created in response to a steady stream of requests for such a plan. It combines the efficient-to-build cape cod style with farmhouse elements and as such should appeal to a wide audience with a range of needs. The beauty of this home is found in its compact size (1st floor = 1,270 Sq. Ft. with maximum = 2,260 Sq. Ft.) and a focus on rich, traditional detailing throughout. It boasts a comfortable, open floor plan with 2 fireplaces and ground level Master Bedroom Suite. A covered, wrap-around porch connects the interior spaces to the home's natural surroundings. Perfectly suited to growing families & empty-nesters alike. Large, wrap-around porch. Front foyer with vaulted ceiling, open kitchen with fireplace, dining room and living room with fireplace, Master bed room (#1) suite, master bath with walk-in closet, side entry mudroom connector with 1/2 bath & laundry and 2-bay Carriage Shed. Three dormers above porch. Hallway closet storage, bed room (#2) and (#3) with shared full bath. Bonus room above Carriage Shed. Contact Classic Colonial Homes for pricing information.